N.B. : It can be shown that the condition for a state of stress to be one of pure shear is that the first stress invariant is zero. In all the previous work on complex stress systems it has been assumed that the stresses acting on the sides of any element are constant. 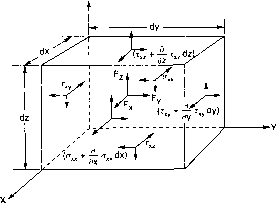 In many cases, however, a general system of direct, shear and body forces, as encountered in practical engineering applications, will produce stresses of variable magnitude throughout a component. Despite this, however, the distribution of these stresses must always be such that overall equilibrium both of the component, and of any element of material within the component, is maintained, and it is a consideration of the conditions necessary to produce this equilibrium which produces the so-called stress equations of equilibrium. Fy and Fz. The element shown in Fig. 8.16 then displays, for simplicity, only the stress components in the X direction together with the body-force stress components. It must be realised, however, that similar components act in the Y and Z directions and these must be considered when deriving equations for equilibrium in these directions: they, of course, have no effect on equilibrium in the X direction. Fig. 8.16. Small element showing body force stresses and other stresses in the X direction only. It will be observed that on each pair of opposite faces the stress changes in magnitude in the following manner, e.g. Multiplying by the area dydz of the face on which this stress acts produces the force in the X direction. these equations being termed the general stress equations of equilibrium. Bearing in mind the comments of §8.2, the symbol r in the above equations may be replaced by a, the mixed suffix denoting the fact that it is a shear stress, and the above equations can be remembered quite easily using a similar procedure to that used in §8.2 based on the suffices, i.e. first suffices and body-force terms are constant for each horizontal row and in the normal order x, y and /.